They are described following this preamble. I chose to self-published my book and did so with a great deal of advice and support. As the publisher it’s my responsibility to distribute the book. Last March, 2016, the Manitoba Writer’s Guild newsletter announced an Inaugural Whistler Independent Book Award. The $100 entrance fee promised an evaluation. I sent off the fee and the book with no further exceptions. The unexpected result was that as a finalist I attended the festival in October and received a certificate and the promised evaluations. It was most rewarding experience and I thank Vivalogue Publishing Canada Ltd for recognizing the talent of independent writers and their need for recognition. I share the evaluation process. First, members of the Vancouver Chapter of the Canadian Authors’ Association selected the finalists according to four criteria: Ideas/Organization/Content, Style/Voice, Word Choice/Sentence Fluency and Conventions/Production Values. They evaluated each of the four criteria in detail and awarded For Elise, 93 out of 100 points. I plan to place the full form on my blog. This compelling story is at times almost too painful to be read. But it uncovers women’s history that, as Veldhuis describes, “disappears like meals placed before hungry men.” The content is rich in many ways: family ties, Canadian history, class structures perpetuated by settlers, etc. This is a story that cannot easily be forgotten. Its rich detail and personal style create the power for it to become a classic in print, and perhaps as a stage or screen play. The narrative and primary sources are seamlessly woven into a story that keeps the reader on the edge with Elise and her family. The design and format of the book will appeal to readers of history and women’s studies. Thank you everyone for your support of ‘For Elise’. Reaching the finals is a huge reward that has brought a whole bundle of new experiences. I am blessed indeed. 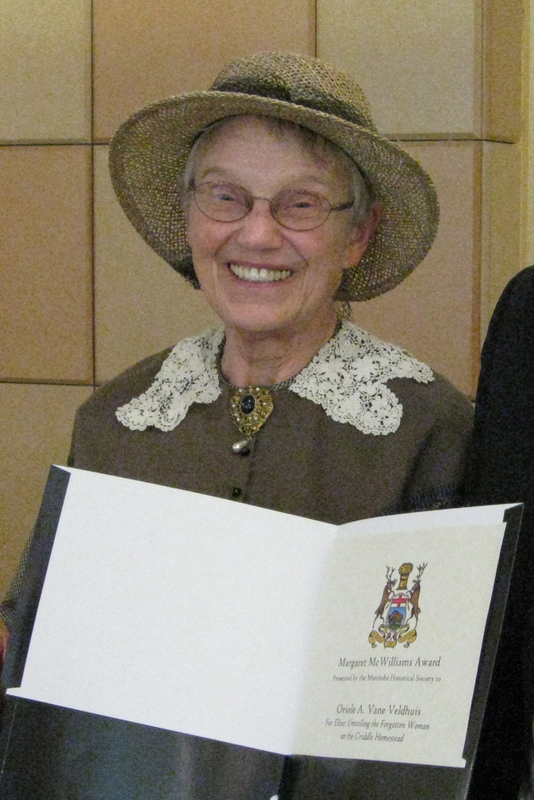 the Margaret McWilliams Award in local history, 2012. I accepted the honour on behalf of the Vane family and the many friends who supported me and made it possible to publish this secret breaking account of Elise Harrer’s sacrificial life.